A fantastic stone cottage close to Fiscardo. Completely private with a crystal pool and unending views. Nestling amongst ancient olive trees Lemoni is an intimate stone cottage that oozes charisma and style. Originally dating from 1893 and set in an olive grove, it has been completely renovated and imaginatively designed to take full advantage of the magnificent views around it whilst still remaining secluded from its neighbours. Charming Lemoni Cottage is the perfect retreat for honeymooners or for couples seeking a relaxing holiday and is the perfect “chill spot”. The villa also comes with a discounted rate for car & boat hire please enquire. The accommodation is all on one level with high vaulted, colour washed pine ceilings which create a cool, spacious interior and by using natural materials such as wood and stone together with comfortable furnishings, a tranquil ambience has been created inside. The living area is open plan, comprising a bedroom area, which is separated by a low wall from the lounge, dining and kitchen areas. Doors not only allow the light to flood into the cottage but also lead out onto the large terrace where you can eat or just sit and enjoy the fantastic views across the sea to the Lixouri peninsular on the horizon. The terrace area also gives you easy access to the garden and swimming pool as well. The sunsets especially, where Lemoni is situated, are really stunning and not to be missed! There are two beaches close by (Alaties and St Ierousalim), which are a short drive away and many other beautiful beaches can be found in the surrounding areas. Two small supermarkets are situated in the village of Magganos and there is also a restaurant within walking distance of the cottage too, where food is prepared in a wood oven. Other places to eat can be found in nearby villages and the quaint harbour of Fiscardo, which has a larger selection of restaurants and shops, is a 15 minute drive from Lemoni. Everything met our expectations. A lovely little house with glorious views, a comfortable bed, well equipped kitchen and complete quiet apart from the cicadas and the distant tinkle of goat bells. Our cleaner was an absolute star and helped us in so many ways - going above and beyond to help me with a much needed delivery of medical supplies! The local contact was also super helpful. Would unreservedly recommend this property. A very attractive house, well equipped and laid out in a private and peaceful location. Outside there's more space than we expected, secluded areas for eating/drinking outside, sunbathing or in shade around the pool. Handy location for Fiskardo and the north, easy drive down to Assos. A couple of minutes walk away is Ranzo Ionio where we had excellent meals, recommended. A drive of five minutes or so to the always good Odysseus taverna at Jerusalem, not to be missed. Super clean property with views forever. Our week at Lemoni was totally delightful. 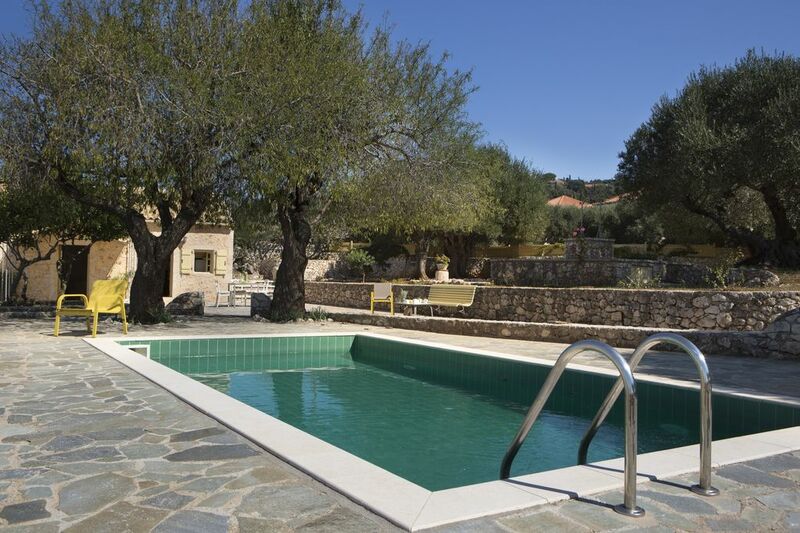 The location is perfect with a secluded feel but not far from the village and only a short drive to the beautiful town of Fiscardo. The views are breathtaking and having a wonderful organic restaurant just 2 minutes walk through the garden gate was a real treat as they also offered a great selection for vegetarians. Kefalonia is a truly stunning island and the people were lovely. We booked with Bob at Greek Island Retreats and he was very helpful and even a arranged car hire for us as we arrived very late at the airport. We can highly recommend Lemoni and Greek Island Retreats and we hope to return one day. Many thanks for the kind review and I am so pleased you enjoyed Lemoni, we hope to welcome you back to Kefalonia in the near future. The cottage was everything we hoped it would be. Idyllic setting, stunning sea views and very, very peaceful. The perfect place to relax. We hired a car and visited some fantastic places, we fell in love with the island. We would highly recommend the family run taverna Ranzo Ionio, which was right on our doorstep. They gave a very warm welcome and served fabulous organic produce from their farm, cooked in a tradition wood oven. We booked our holiday through Bob at Greek Island Retreats and we wouldn't hesitate to do so again. He was very helpful and efficient with all the booking process and gave us lots of information about the island, with tips on where to visit and eat. Thank you for a wonderful holiday! I'm so pleased the villa was all you expected it to be and the island lived up to it's reputation. We look forward to welcoming you back to Kefalonia in the near future. What an amazing week we had in Kefalonia!! This was our first time on this stunning island and what topped it all was being able to stay in this outstanding stone cottage with views across the Ionian Sea. Although the sea is a mile or so away, due to the elevated location of the cottage, it looks and feels like you are right beside it. The picture on this site illustrates this very well. The lemon and almond trees by the pool give great respite from the sun, if required. The raised beds in the large grounds are in keeping with the stone cottage and the beautifully kept plants and flowers are a delight. Every day we could see something new in the garden, it even has it's own well and olive tree orchard. You have a real sense of privacy throughout the grounds without feeling isolated. The 1893 Lemoni cottage is exactly what we wanted and more. The village of Magganos is within walking distance and there are a couple of restaurants and two well stocked shops with everything you need, mini supermarkets and minutes drive to Fiscardo. It had a well equipped kitchen, which for us was great because we cooked local food without any trouble, everything to hand. The cottage was clean, spacious and nice and cool thanks to the window shutters, a God send when sleeping or even during the day when we wanted to get out of the heat for a while. The bed was comfortable with a mosquito net, although, we didn't need it. We booked our stay through Greek Island Retreats and our contact Bob Avaient made the whole experience of booking a pleasure. Our queries were answered without delay and valuable information was given to us about local restaurants, shops, beaches etc. We cannot wait to return! So pleased Lemoni was all you expected it to be, the owner is understandably very pleased with his garden. We look forward to welcoming you back to Lemoni & Kefalonia in the very near future.